Hikers will be surprised by the natural diversity in Oulanka National Park. High cliffs give way to mires and soft sandy beaches to lush forests. Does Oulanka have Finland’s most species-rich nature? Experience the different shades of nature during all the seasons. You’ll feel like a tiny part of the great spectacle of life when surrounded by the national park. Foaming rapids and spectacular waterfalls. Rivers that are constantly shaping their channels. The flowing waters will hook you on shooting the rapids! The emblem of Oulanka National Park is the calypso orchid. This delicate flower grows on beds of moss deep in the forest. Its pollination is based on deceiving pollinator insects. Oulanka has an abundance of organisms! The park is a place where eastern, northern and southern species come together. Hay making increases natural diversity. Volunteer work done on behalf of nature also enhances well-being. The Oulanka National Park represents nature in the northern boreal forest zone. The area's highest hills reach to 380 metres above sea-level. The lowest altitudes, 151 metres, are in the river valleys. The hilly landscape is dominated by Scots Pine forests, which have remained untouched by saws and axes since the felling took place there in the early 20th century. Sheltered by the trees, nestled in a bed of moss, grows the fragile orchid - calypso - Oulanka National Park's floral emblem. Oulanka is the National Park of flowing water. The area is traversed by two large rivers flowing east, the Rivers Oulankajoki and Kitkajoki. The National Park also has several tributaries, such as the Rivers Maaninkajoki and Savinajoki, and many little brooks. The River Oulankajoki is the heart of Oulanka National Park. The waters of the 135-kilometre-long river originate from the Salla mires and the actual river begins at Lake Aittajärvi. The River Kitkajoki, which begins at Kiveskoski Rapids in Lake Ala-Kitkajärvi , and the River Kuusinkijoki join with the River Oulankajoki before it reaches the border zone. Oulanka River Valley was formed during the last Ice Age about 11 000 years ago. Moving ice smoothed out jagged cliff edges and transported many tons of fine sand to bottom of what is now the River Oulankajoki. Steep sided ravines and river valleys, which traverse the park, ensure that the landscape is unforgettable. The natural and cultural landscape of the River Oulankajoki have been named one of Finland's National Landscapes. "Renowned for its rapids the Oulanka River Valley, with its rugged ravines is part of the exceptional nature of the Kuusamo forested hills. The calypso orchid lives in old herb-rich forests dominated by spruce. You can also see the species in mixed juniper and pine forests and on the edges of spruce mires if the earth contains enough lime. Along with the daphne and willows, the calypso orchid is one of the first flowers to bloom in the spring. In the summer after it has bloomed, the plant can be identified by a basal leaf hidden in the moss, the underside of which is violet coloured. The leaf has lengthwise veins and is wrinkled. The calypso orchid flower has no nectar, so its pollination is based on deceiving pollinator insects. After a bee has crawled into the flower and discovered that it contains no nutrients, the deception is already – or only – partly successful. The pollen sticks to the insect’s back as it leaves the flower. Now another plant individual has to succeed in deceiving the same insect in order to ensure pollination. If pollination is successful, an inconspicuous brown pod develops from the flower. The pod scatters seeds the size of pollen particles in the autumn winds. These seeds have to fall in a suitable spot on the ground and then find a partner fungus growing as a mycelium. The plant will live rest of its life in symbiosis with the fungus. Calypso orchid pod production varies each year depending on the weather conditions while it flowers and the number of pollinators. The calypso orchid grows slowly and it can take years to develop from seed to blooming plant. If the site is favourable, a patch comprising dozens of individual plants can develop in the same place over a period of decades. Partly due to calsium-rich bedrock there are many rare species in Oulanka National Park. The difference in temperature between the high rising fells and low river valleys make an ideal environment for a versatile range of species and make it possible for rare species to habitat the area. For example the park's emblem plant, the calypso, is threatened, but common in this area. Other nationally endangered species that appear in Oulanka are pohjanailakki (Silene furcata ssp. augustiflora) and lady's-slipper. Spring and autumn floods, especially, make space for fragile plants among which are Mountain Avens, arnicas and Tartar Catchflies. In Oulanka's meadows, visitors may catch a glimpse of the endangered Copper Violet butterfly. Many boreal moth (Xestia) species also inhabit the area. Oulanka's distinctive herb-rich forests and broad mires make the National Park a versatile habitat. The vegetation of the herb-rich forests is especially abundant and lush. Some plants that grow in the area are the European baneberry, the Daphne, the Woodland strawberry and the Frog orchid. Dry herb-rich forest on the edges of Norway Spruce and Scot's Pine forests are typical of Oulanka National Park. Some species that appear in them are Dark Red Helleborine and Dwarf Milkwort. Chalk springs and ponds are rare but there are some in Oulanka. Chalk from the surrounding ground makes the springs' water alkaline and their vegetation demanding. The turjanhorsma (Epilobium laestadii) is one of the most peculiar plants of the chalk springs. The diverse mires also have Marsh Saxifrage (Saxifraga hirculus) and mosses, which are rare. There is information on Oulanka's forest fires from the 19th century onward. Wild fires have left their mark on the region's landscape and nature. Old tree stumps still bear black burn scars left by raging fires of the past. Even today small forest fires burn in the park occasionally. Some rare species such as beetles benefit from fires. 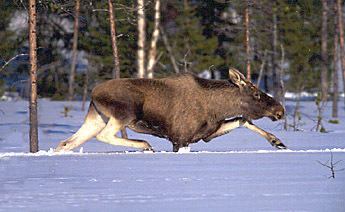 The moose (Alces alces) and the half-tame reindeer (Rangifer Tarandus) are common in the National Park. Small mammals are also typical in the area. Of the large carnivores the bear inhabits Oulanka National Park. The wolf, wolverine (Gulo gulo) and lynx (Lynx lynx), however, are quite rare in the park. Birds which are common on the shores of flowing waters in Oulanka are the White-throated Dipper (Cinclus cinclus) and the Common Sandpiper (Actitis hypoleucos). In the park's wilderness zones the Golden Eagle (Aquila chrysaetos) and the White-tailed Eagle (Haliaeetus albicilla) are common. Several southern species also nest in Oulanka National Park. Among them are the Blackbird (Turdus merula), the Winter Wren (Troglodytes troglodytes) and the Wood Warbler (Phylloscopus sibilatrix). The species, which appear in the largest numbers, are the Willow Warbler (Phylloscopus trochilus), the Common Redstart (Phoenicurus phoenicurus) and the Brambling (Fringilla montifringilla), which can be heard gurgling in spruce forests. The Kiutaköngäs, near Oulanka Visitor Centre, has nature trails and is the main habitat of northern spruce forest birds. The Grey Wagtail (Motacilla cinerea), which has nested for several years on the banks of the River Oulankajoki, is a special feature of the area. The White-throated Dipper can also be seen quite often at the river. In late winter visitors can hear the drumming of woodpeckers on Liikasenvaaran tie Road. The Pieni karhunkierros Trail in Juuma in the southern part of the park leads through different types of forest. It is, therefore, easy to watch many different bird species on your visit. The best time to visit is the beginning of June, when especially mornings are a sure time to see many species. The Red-breasted Flycatcher (Ficedula parva) is a annual visitor to the park and can be seen at Savilampi in the northwest of the park. The surface of the River Oulankajoki rises over two metres during spring floods. The water is rich in humus and dark-coloured. It carries soil and minerals down stream. The swift current also carries trees, branches and sometimes built structures with it. In the 1960's hay still grew naturally in water meadows, which flooded in spring and autumn. The hay was harvested to feed livestock. Part of the meadows were mechanically flooded by damming. This made the meadows rich in minerals and more productive. Today some of the traditional meadows have a management plan, by which they are annually cleared, mowed and dammed. Part of this work is done by volunteers. By managing the meadows, valuable tradition, by Finnish and even by European standards, is preserved on the shores of the River Oulankajoki area. Some plants found in the meadows are the Common Moonwort (Botrychium lunaria), the Globe-flower (Trollius europaeus), Fringed Pink (Dianthus superbus L) and Bluebells (Campanula rotundifolia). Oulanka reports. Publications of Oulanka Biological Centre. University of Oulu (www.oulu.fi).